Respiratory health affects the lungs and other parts of the body that play a role in breathing. 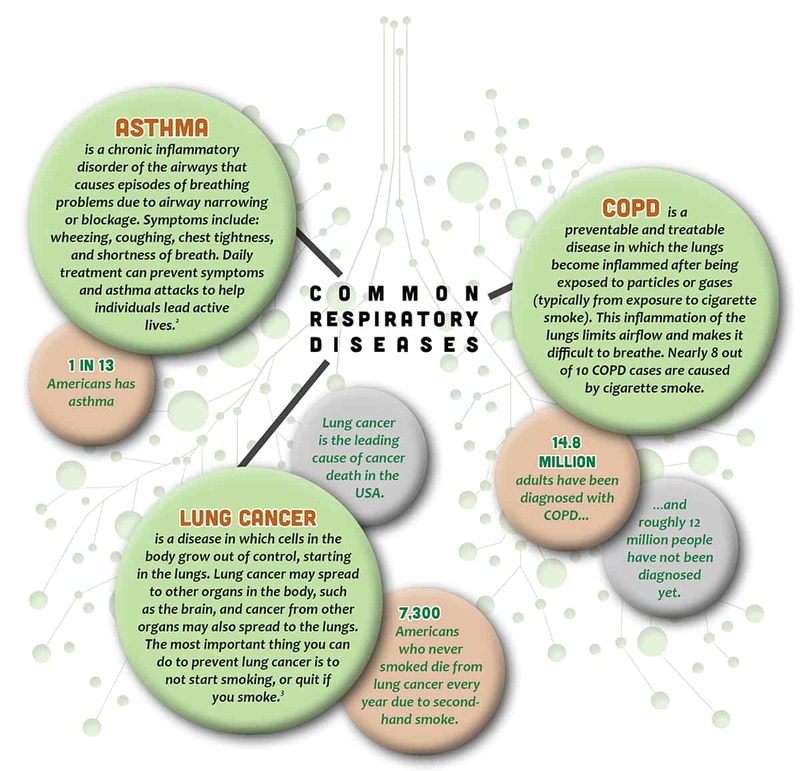 Diseases of the respiratory system may be caused by infection, smoking tobacco, breathing in secondhand smoke, or exposure to other air pollutants. Respiratory diseases include asthma, chronic obstructive pulmonary disease (also known as COPD) and lung cancer, among others. Click on the graphic below to learn more about each of these conditions. Across Jefferson, Lewis and St. Lawrence counties, nearly 1 in 4 adults (24%) are current tobacco users, and an additional 22% are former tobacco users. The highest rates of tobacco use are found in men (32%), adults ages 18-34 (34%), active-duty military households (36%), and Medicaid enrollees (40%). The North Country’s death rate due to chronic lower respiratory disease is 48 deaths per 100,000 population every year, which greatly exceeds the New York State average of 29.1 deaths per 100,000. About 4% of adults report a diagnosis of COPD, including 10% of those 75 or older. Lung and bronchus cancer are the most common and most lethal forms of cancer in all three of our region’s counties. Improving respiratory health is not just an individual responsibility; it requires support from communities and health care providers. • Avoid poor air quality areas, and wear masks or respirators when working in dusty, smoky or other harmful environments. • Ask their health care provider about tobacco cessation options, or refrain from smoking around others in the home. • Get screened for respiratory diseases, especially if they belong to a higher risk group. • Promote good air quality in workplaces and homes. • Refer to appropriate services, such as tobacco cessation and screenings for common respiratory diseases.